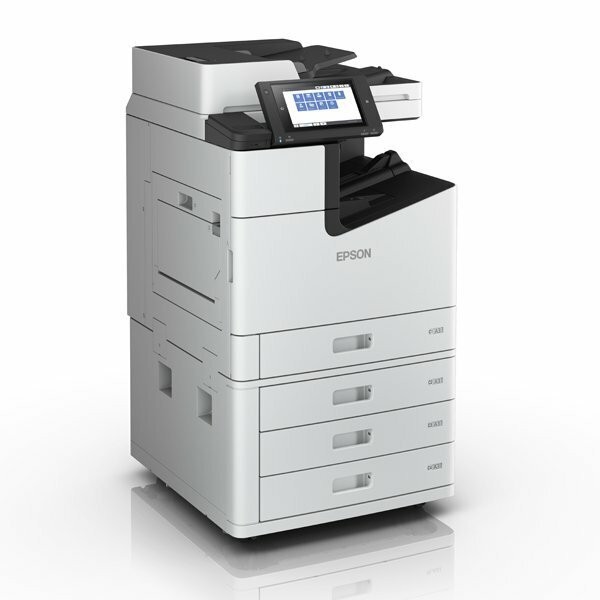 Print high-quality documents at superfast 100ipm speeds with this reliable and environmentally-friendly departmental colour A3 business MFP. The WorkForce Enterprise business inkjet printer combines ultra-fast performance with low energy consumption. Designed for printing high volume jobs, this environmentally smart multifunction business printer is capable of delivering superb print quality at superfast speeds up to 100ipm. Discover excellent quality at incredibly high speeds. Enjoy consistently superb image quality at 600 x 2400dpi and print speeds up to 100 images per minute in simplex and duplex, matching and even beating most laser printers. Take advantage of up to one and a half times faster for first page out and two and a half times faster for typical business print jobs of just a few pages than colour lasers and copiers1. Use up to 88% less energy compared to lasers1. With low waste supplies and a simple working mechanism the WorkForce Enterprise reduces the environmental impact of print, by providing a low power solution with fewer supplies required. Enjoy a high paper capactiy of 5,350 sheets, and print up to 100K black2 or 50K colour pages without replenishing ink.